Looking for a gay bar in Osaka that?s not too big, not too small, not too noisy, but not too quiet" And on top of that, easy on the pocketbook too" J?s OSAKA has it all, and their foreigner-friendly vibe makes for a sure-fire success! The manager (his name is ?Ura,? but just call him ?Tencho,? which means shop manager), while not usually in drag, is set on making your stay pleasant, and will be happy to speak English with you. Gay bars may come and go, but J?s Osaka is no flash in the pan, already going strong for over fifteen years. Yet it still feels fresh, and the mixed crowd makes it so just about everyone has someone they?d like to talk to, or at the very least gawk at. 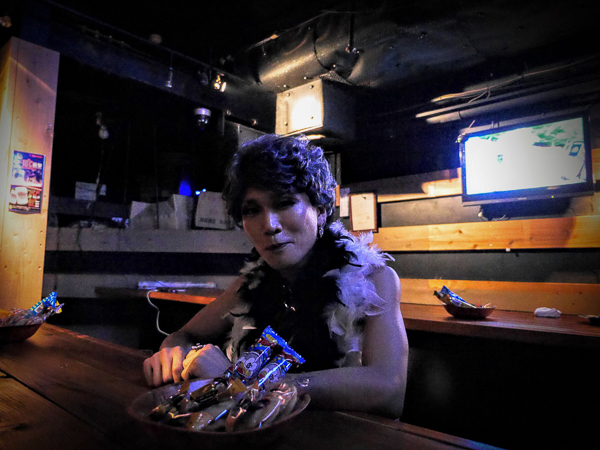 Unlike many gay bars in Osaka and elsewhere in Japan, J?s OSAKA welcomes women and non-gay patrons as well. The crowd is, on the whole, more of the 20s and 30s set, but being older than that would certainly not be a problem. Patrons fall more into the ?pretty boy? category than the bear, macho, or sportsman buckets.